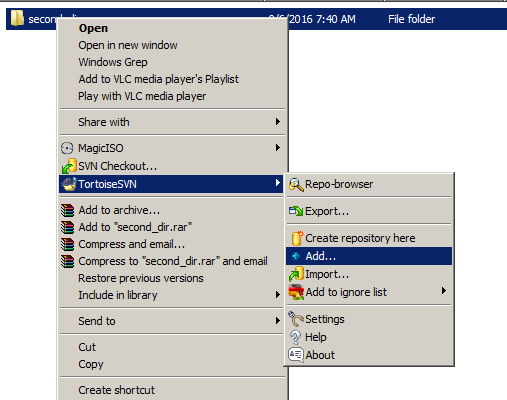 This tutorial explains how to setup and use an SVN repository server on CentOS. Before I start, let me explain what actually SVN represents and what it is used for. SVN is actually an abbreviation of SubVersion which had been created by the Apache software developer. It enables you to create and maintain your own repository and gives fine-grained access rights to a dedicated user. It is very effective for controlling the versioning of files, documents or folders. It is very useful for any group or team that intends to start their own software projects. For this tutorial, I am using CentOS 6.4 in the 32bit version. The end result will show you how a dedicated client can manage to access the SVN repository using any kind of operating system platform. To start with a fresh SVN server, we need to install certain packages. The packages related are apache httpd, mod_dav_svn and subversion. The HTTPD package is needed as a web server service for this process. Once done, you'll notice that several related folder and files will be created by default under our new repository directory. Based on the configuration above, we've set different privileges for the 3 users that we created earlier. We assigned user FARID to have READ ONLY privileges, FIKRI to have READ WRITE privileges and JAY or others to not having any privileges. Means that later in testing I'll show you that user JAY will not be able to view any files in the repo1 repository. Now let's edit the HTTPD service configuration file. Check that the following line exists to include external configuration files into the httpd.conf file. If it does not exist, add it at the end of the file. The first two lines load the apache SVN module, the next lines define that the URL /repo1 points to our created repository. We also set that specific users have read/write privileges on specific items within the repository using AuthzSVNAccessFile. The list of users will be taken from the /data/svn/repo1/conf/passwd file. 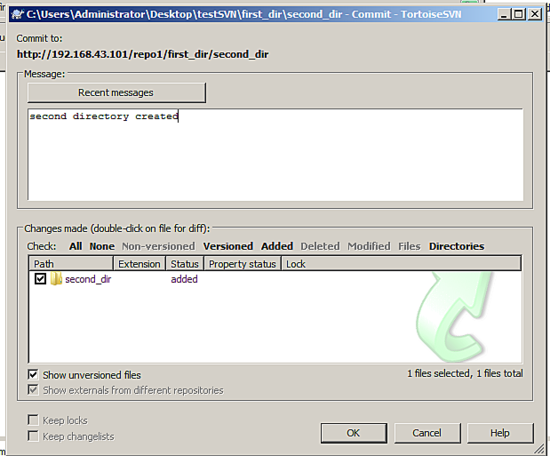 Now restart the HTTPD server in order to load the configuration changes made. Let us check whether the configuration we've made meets the purpose or not. For the testing phase, I'll use 2 different client machines. I will use Microsoft Windows and a Linux CentOS 6.4 Desktop. First I'll go to the Linux CentOS 6.4 machine and checkout the repository into the local system. As Linux client, we need to install the subversion package to connect to the SVN repository. Excellent! We've managed to checkout the repository from our SVN server using the user fikri. 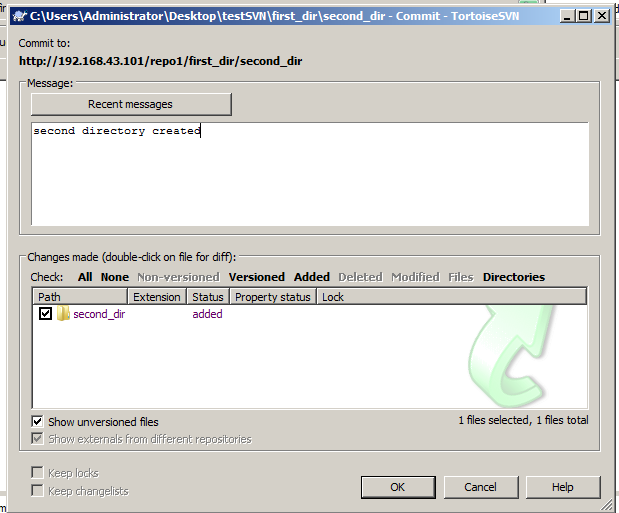 Now, to check whether this user has READ and WRITE privileges, we'll create a folder inside the repository directory. svn commit -m "My first folder"
Which means that our commit was successful. Great job! We have managed to create a folder inside the repository directory and committed it. Login with the user JAY. I'll assume that this user will not able to access the page as he is not a member of the privileged group. Nice, now let's make a final test for this tutorial. Let's use the Microsoft Windows machine as SVN client. To do this, we have to install a SVN client software, for this cases, I'll use TortoiseSVN . You may download it here or use any of your familiar SVN clients. 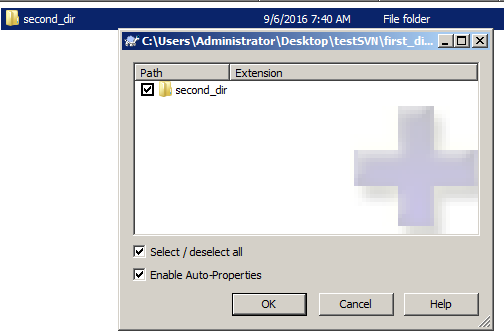 Once installed, create a new folder in your Windows machine and name it as testSVN. Then right click on the folder, you'll notice that there are links for SVN CheckOut now (if you dont see the links, restart Windows). Click on "SVN Checkout" to proceed. Once clicked, a popup box will be shown like the one below. 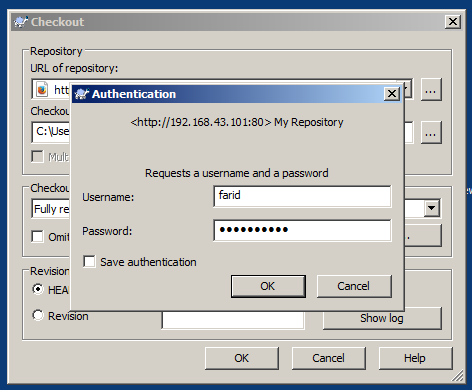 Enter the SVN server repository under the URL field then click OK.
A popup box will be shown that requests you to enter a username and password for authentication. For this cases, we will use user FARID to proceed. 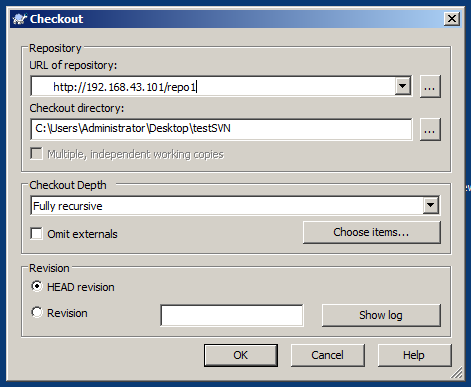 Once done, a popup box will show that the SVN repository checkout has been finished. From here, we can conclude that user FARID has the privilege to READ from the repository. 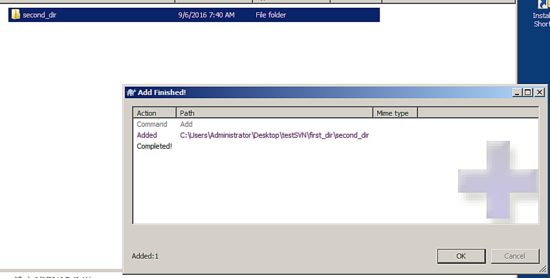 You'll notice that the folder that was created previously from user FIKRI exists in your testSVN directory. Once created, right-click on the folder and hover to TortoiseSVN, you'll see there are several of choices listed in there. To proceed, click on the Add button. This button will add the folder that we created to the local svn repository. A popup box like the one below will show up, click OK to proceed. Once done, a popup message like below will be shown. Now you've successfully created a folder in your client repository. Even though the folder has successfully created and added locally, it is not yet synced to the SVN server, Therefore other users from other machines won't be able to see the folder that we have created just now. Save and commit the folder now. 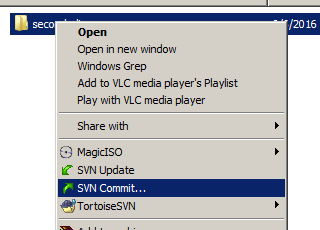 To do that, right-click on the folder and click on SVN Commit as per below screenshot. A popup box like below will be shown to request you to confirm several details. Type in any optional comment, then click OK to proceed. An authorization box will appear to request for a login username. Type in as user FARID and proceed. Once done, you will be shown an error stated that you are forbidden to do the changes. Thst what we expected as the user farid has just Read-Only privileges. Congratulations! Now we have set up our first SVN server and successfully configured proper privileges on certain user limitation. May I ask you if you are a time traveller? An article about setting up SVN, written in 2016 - are you serious? CentOS 6.4 32-bit? This article has been published ages ago and submitted as a "new" one - the reason for not putting a date on it. This is truly sad for otherwise nice website howtoforge. The world has moved on, check out GIT. Welcome GIT fans. Some users still use and prefer SVN over GIT and this tutorial is written for these users. SVN is a stable software which works well in small teams. You are a GIT user and don't like SVN, why do you read and comment on an SVN article then? There are several articles about installing and using GIT available at howtoforge. This article has not been published before, and the date is shown in the upper right corner for those who have not noticed it: "Published Sep 08, 2016". How do you version control binary files like excel spreadsheets , without using complex third party tools. I had the same problem. It is due to SELinux security context.